Nvidia has quietly listed a pair of new GPUs for inclusion in PC laptops. If you have shopped for a thin and light laptop with a discrete GPU recently, you will have likely come across devices with GeForce MX150 or MX130 GPUs, and today we see what appear to be the successors to these parts officially listed. 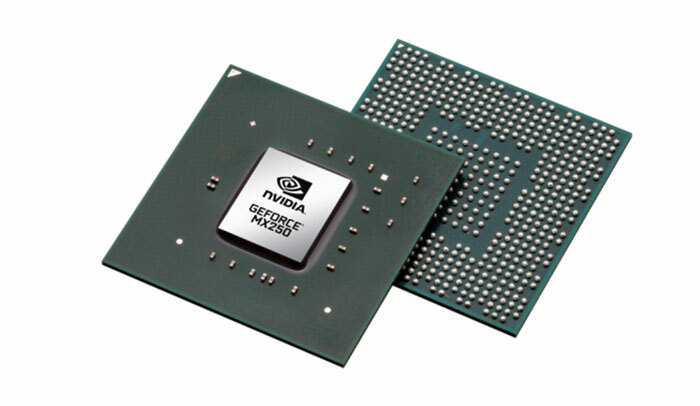 You might expect the GeForce MX230 and MX250 to represent a step up in performance and capabilities over the MX130 and MX150 but from the information shared by Nvidia they could actually perform very similarly, or even worse than their predecessors. 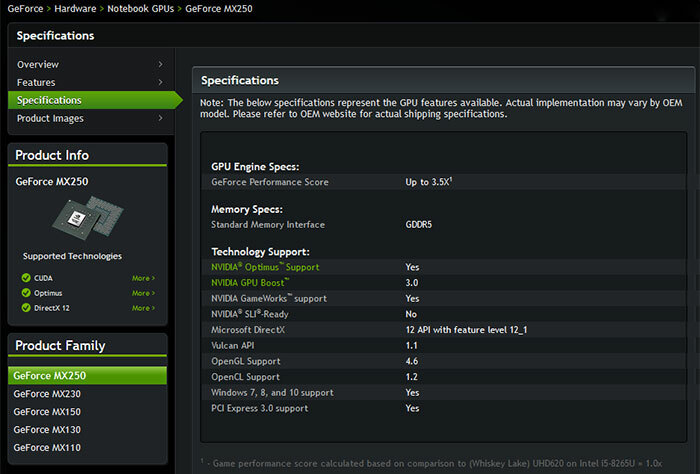 In the above table I have put in the key features, as far as the info from Nvidia allows. It appears that there is expanded support in the new GPUs for OpenGL 4.6, and OpenCL 1.2 APIs too. There was some upset / controversy with the GeForce MX150 as, after launch in May 2017, an unflagged specification change was observed a year later. NoteBookCheck noticed at the time that laptop vendors were shipping systems with significantly different GPU performance depending upon whether a GTX 150MX 'N17S-LG-A1' or '1D12' variant was installed in the machine. The common 1D12 variant sadly delivered about 20 to 25 per cent less 3D performance than a 'standard' MX150 as it was set to operate in a 10W power envelope (rather than 25W). Whether Nvidia and its laptop making partners will indulge in the same nebulous product strategy, or it will be clearer now, remains to be seen. 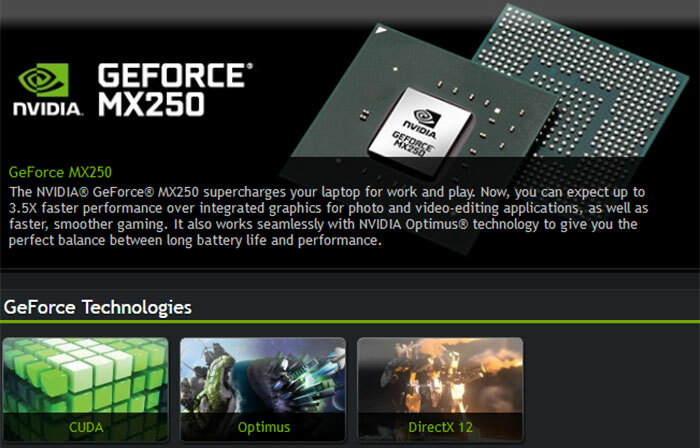 Nvidia doesn't share such information, and NoteBookCheck doesn't have information on this as yet. If you are shopping for a thin and light laptop featuring a GeForce MX and the GPU performance differences might be important to you, please check reviews of the actual product you are interested in, with particular attention to the GPU performance/specs, ahead of your purchase. Back in December we spotted the first HP laptops featuring GeForce MX 250GPUs and more recently MSI PS42 8RA and PS42 8M0 machines featuring this new laptop GPU have been seen online. So, as usual, we can't trust Nvidia to label their products in a coherent manner which allows consumers to make educated decisions without delving into obscure technical details (which of course everyone has the time, knowledge and understanding of PC bits and bats to do). At BEST this kind of strategy is misleading. At worst it's an outright con. Every bit of information they release is carefully considered at multiple levels within the company so it's usually not a mistake. Either way, if there's any confusion as to what I'm getting, I just go to the competition. It has happened before where a manufacturer has made it so confusing or difficult to ascertain what I'm paying my money for (or seemingly purposefully hidden an important specification) that I've just ruled out buying from them. That has happened with cameras, phones and a few other things. But its look great in marketing material. For common buyer MX250 is better than MX150 and its nvidia so it is better than anything from AMD. “It's Nvidia so it's better than anything from AMD”. Hmm, I honestly can't tell if you're being serious or making fun of fan boys. As you are well aware, it all depends on the pricing and I'd rather have certainty in what I'm buying. A chip being 20% poorer in performance with exactly the same name is just not on. And the “common buyer” is exactly who is being taken advantage of here as they're not going to know this kind of thing is going on.